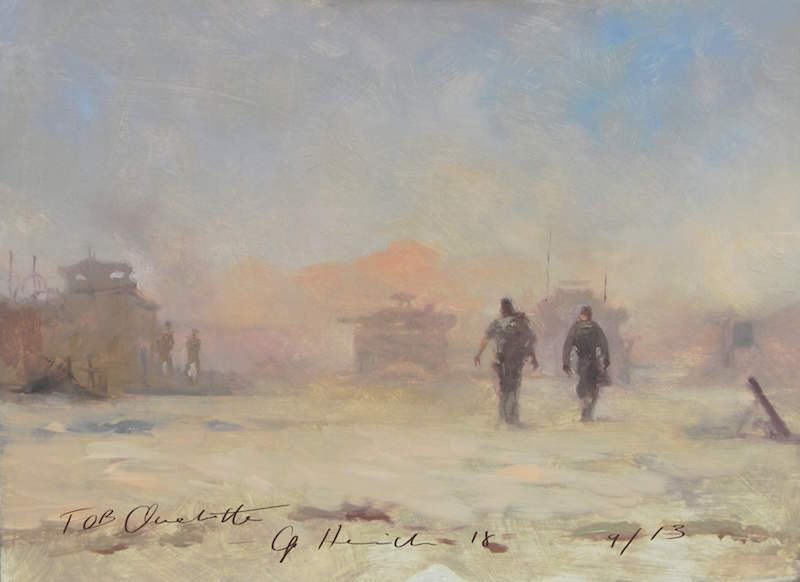 Michael Alford has been appointed as official War Artist to the British military on three occasions. In 2010, he accompanied the First Battalion Grenadier Guards during their deployment to Helmand Province, Afghanistan. There he lived and painted alongside the soldiers and toured the forward patrol bases on the edges of ISAF-controlled territory. 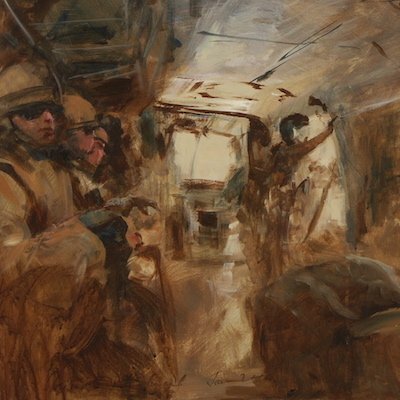 From this experience, Michael produced his first Afghan sketchbook, a series of studies in pencil and watercolour, painted entirely in the field. A further series of oil paintings followed from this primary material. These were displayed in a special exhibition at the Royal Geographical Society in 2010. Michael subsequently donated the Afghan Sketchbook to the Grenadier Guards for use in their fundraising in support of wounded soldiers and their families. Individual prints from the sketchbook can be ordered through the Grenadier Guards’ website. All proceeds go to charity. 2013 saw Michael returning to Helmand Province, this time with the 1st Mechanized Brigade. 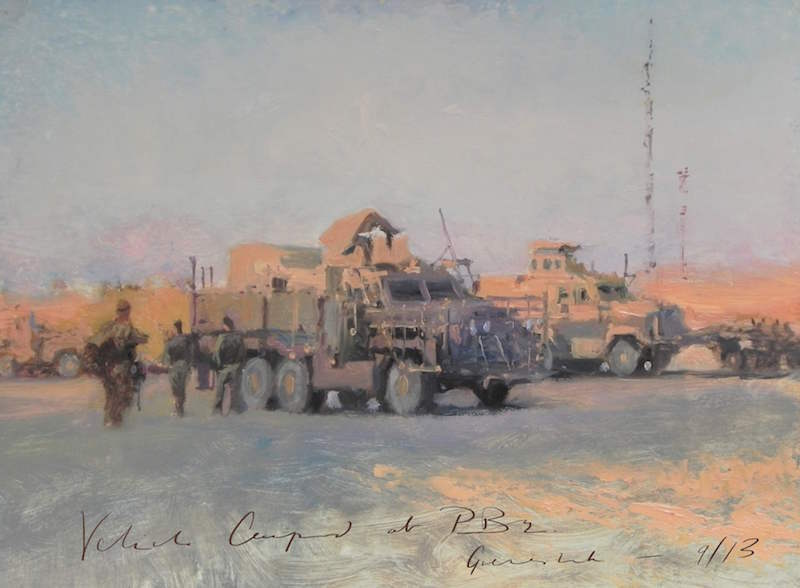 The commission included a large painting for Brigade headquarters at Tidworth, Wiltshire, commemorating participation in one of the final operations of the Afghan conflict. A second large oil painting was subsequently commission by the Household Cavalry for their headquarters at Combermere Barrack, Windsor. Michael also produced a second series of sketches and oil paintings from his second tour. One of these paintings, Patrol at Pan Kalay Police Station, was purchased for the collection of the National Army Museum in 2016. Michael was commissioned by the military for a third time in 2016. He accompanied 1 Rifles on their mission to train Kurdish forces in Northern Iraq prior to their campaign to retake Mosul from Islamic State. The “official war artist” didn’t exist when the young art student Paul Nash enlisted in the military at the outbreak of World War I. In 1914 there were only artists, or soldiers, or soldiers who just happened to be artists. 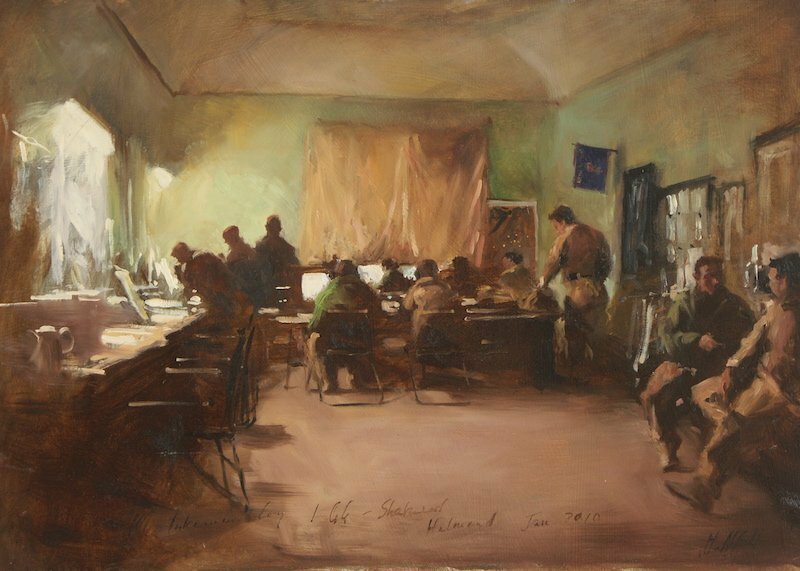 Nash began humbly as one of these—but he ended up as one of the most prominent and outspoken official war artists in Britain, leaving behind a legacy that continues to exert a powerful influence on war artists like Michael Alford today.